Before you bring your new equine companion home, you'll want to learn about the basics of good horse care. Learn how to feed, house, and care for your horse or pony. Discover how pony care differs from horse care, what good health looks like and when to call the vet. Companionship, either with another horse, donkey, mule or pony or another animal such as a sheep or goat. When you bring home your first horse, there are a few essential things you'll need to know in order to care for it properly right away. Learn the basics of feeding, tying and basic care for your first horse. Basic Horse Care: Here is the very basic information you will need to care for your horse properly. Horse and Pony Care By the Day, Week, Month and Year: Have you thought about the time required for properly caring for a horse? I've broken down what you need to do to care for your horse by the day, week month and year. How to Tie Safely: Probably, the first thing you'll need to do when you get your first horse is tie itin a stable or trailer. Here is how to tie your horse safely. Good horse care includes the very best fodder and other feeds for your horse. While grass is a horse's natural food, it's not always available, and may not be adequate in some situations. Hay FAQs: There's good hay, and there's hay that can damage your horse's lungs and cause other health problems. These FAQs will help you choose the right hay. Supplements FAQ: Your horse might need a bit more than hay. Here are some suggestions for making sure your horse gets all the nutrients it needs. Water for Your Horse: Find out why fresh water is essential. Plants Toxic to Horses: Not all that grows in pastures is good for your horse. Learn to indentify plants toxic to horses. 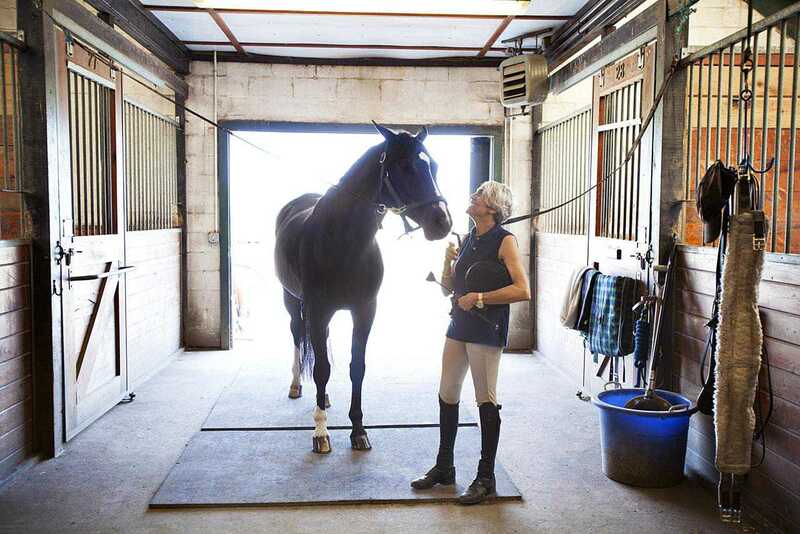 Most horses spend some of their time indoors in a stall. For good horse care and safety, barns, sheds and stalls need to be properly designed. Learn how to design and maintain your barns and run-ins. Designing a Run-in Shelter: If you don't have a barn, or even if you do, a run-in gives your horse a place to get out of the wind and wet. Stable Design: It's exciting building or modifying a building for horses. Find out the ideal size for stalls, flooring options and ceiling height. Pros and Cons of Stables and Run-in Sheds: Should a horse live in a stable or spend 24/7 outdoors? There are arguments for both sides. Choose what's right for your situation. It's an unfortunate fact that horses can get sick and injured. The key to good horse care is being able to identify health problems and treating them promptly. Basic Pulse Respiration Temperature: Learn how to take your horse's vital signs. Colic FAQs: Colic can be scary. Learn how to deal with colic before you encounter it. Equine Parasite Control FAQs: Deworming regularly is essential for good horse care. Horse and Pony Health Check: Know what a healthy horse looks like. Top Ten Essential Items For a Horse First Aid Kit: Here are suggestions for a basic horse first aid kit. Grooming is an important part of horse care. At minimum your horse should be groomed before riding or driving. A quick grooming every day is a good way to check the condition of your horse's skin and hooves. How to Groom Your Horse: Learn to groom your horse, from ear to tail, head to hoof. Shoeing FAQs: Your horse probably doesn't need shoes. But, it's best to be informed before making a decision. Hoof Health - Thrush FAQ: Does your horse have smelly feet? Thrush could be the problem. Not everyone can care for their horses on their own property. Boarding is the next-best thing to providing your own horse care. You'll want to find the best stable, where you and your horse are happy. Here's what to look for, how much it may cost and how to be the type of boarder stable owners are glad to have in their barns. How Much Does it Cost to Board a Horse? Good horse care means providing the best possible environment, that is as safe and natural as possible for your horse. That includes providing companionship, understanding the needs of older horses, and keeping their surroundings clean and well maintained. Does My Horse Need a Companion?